Sol Luckman is a pioneering ink painter whose work has been featured on mainstream book covers, the fast-paced trading game BAZAAR and at least one tattoo on a female leg last sighted in Australia. Sol is also an acclaimed author of fiction and nonfiction. His books include the international bestselling CONSCIOUS HEALING and its popular sequel, POTENTIATE YOUR DNA. Sol’s visionary novel, SNOOZE: A STORY OF AWAKENING, the coming-of-age tale of one extraordinary boy’s awakening to the world-changing reality of his dreams, won the 2015 National Indie Excellence Award for New Age Fiction. SNOOZE further proved its literary merit by being selected as a 2016 Readers’ Favorite International Book Award Finalist in the Young Adult-Coming of Age category and receiving an Honorable Mention in the 2014 Beach Book Festival Prize competition in the General Fiction category. 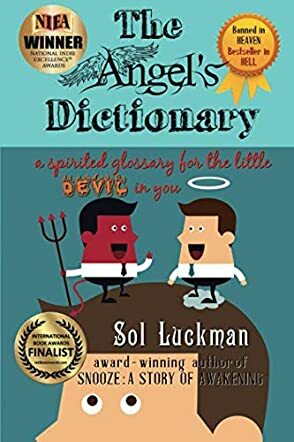 Sol’s new book of humor and satire, THE ANGEL’S DICTIONARY: A SPIRITED GLOSSARY FOR THE LITTLE DEVIL IN YOU, won the 2017 National Indie Excellence Award for Humor. Along with Sol Luckman’s witty and sometimes piercing observations, you can enjoy relevant and related quotes by a number of contemporary and historical persons, famous and infamous alike. From George Carlin and Willie Nelson to Mahatma Gandhi and Johann Wolfgang von Goethe, The Angel’s Dictionary proves that in many cases, no matter how much has changed, everything has really stayed the same. We just use different names and excuses today! While maybe not for everyone, especially those who are offended by anything not PC, The Angel’s Dictionary: A Spirited Glossary for the Little Devil in You certainly provides a hard-hitting look at both how seriously we take ourselves and also how little we are aware of the greater world around us. Sol Luckman’s outlook is quite humorous but also a bit scary as he shows us a present and a future hinted at in works such as 1984 by Orwell and other science fiction stories. They say many a true word is spoken in jest, and perhaps Luckman’s humor is a well-timed wake-up call to be heeded while we still have time to ask important questions. Much of society has lost its sense of humor for fear of melting the heart of the next snowflake down the road. I say, turn up the heat. It is much needed ... THE ANGEL’S DICTIONARY does this with wit and charm worthy of notice. THE ANGEL’S DICTIONARY is a sardonic antidote to the trite and asinine slogans and catchphrases–the basic language–of Big Brother’s thought-control system. On one level, it’s light and witty comic relief, and beyond the playful satire, it is scathingly accurate! If you’re in need of some conscious, fun, and thought-provoking wordplay then you might start with THE ANGEL’S DICTIONARY. Warning: reader may experience symptoms of higher consciousness, greater clarity, and general merriment. I’ve never had so many belly laughs in my entire life. [This book] is absolutely witty, 'spot on' and I LOVE IT ... THE ANGEL’S DICTIONARY (Devilish as it may be) adds a quality of 'lightness' in bringing about such laughter. I do sincerely feel we may each gain by experiencing more and more laughs in meeting the existing chaos.